“Panchkarmaa”, is an Ayurvedic Treatment Center. “Panchkarmaa” center offers ayurvedic therapies like Nasya, Raktamoshana, Shirodhara, Panchkarma, Vaman, Abhyangam, Virechan, Basti and many more. 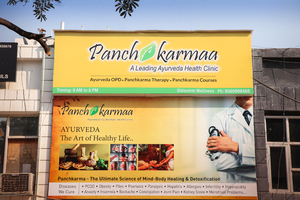 Panchkarma Therapy Center & Doctor is located near GIP Mall in Noida Sector 41..